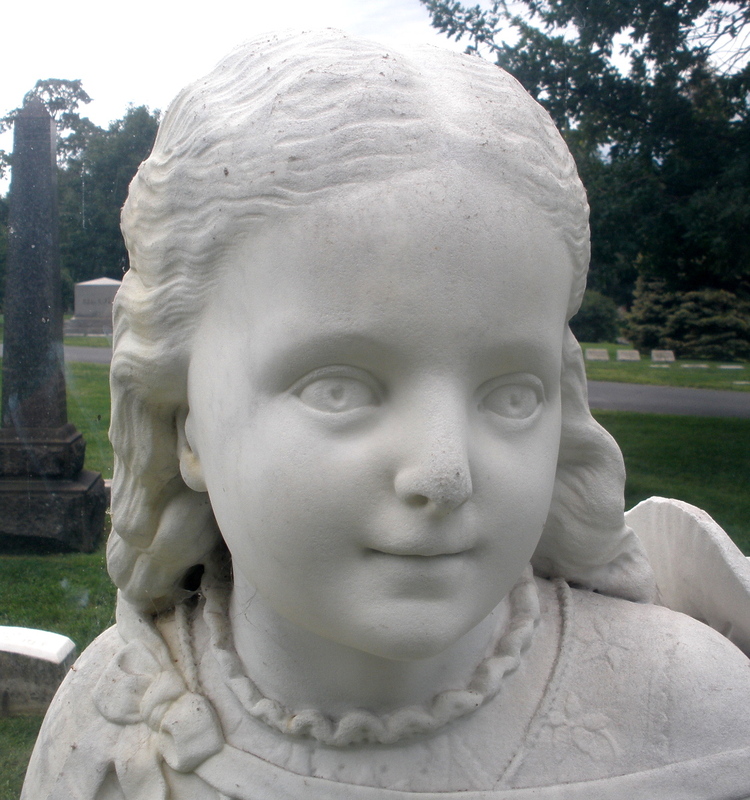 One of the most well-known and mysterious grave markers at Graceland Cemetery is a life-sized, intricately detailed statue of a little girl named Inez, located near the center of the cemetery -- and also at the center of one of the most famous ghost stories in Chicago. The statue rests inside a plastic box, protecting it from the elements, and depicts a young girl seated on a wooden bench, wearing a lacy dress and holding a parasol in her right hand, with a small flower in her left. Her wide face shows a hint of a smile, and her wavy hair is combed back. Her hat rests near her shoulder, tied around her neck by a wide ribbon. A locket and chain rests on her chest. At the base of the statue is the name "Inez," and also the signature of its creator -– "A. Gagel, Sculptor. 1881." The statue was created by Andrew Gagel, who was born in Germany in 1846, and immigrated to the United States in 1872. He lived on West Farwell Avenue, a few miles north of Graceland Cemetery, until his death in 1938, at the age of 92. Beneath that is another marker with the names of John N. Clarke, 1839-1910, and Mary C. Clarke, 1856-1912. According to the most oft-repeated stories, 6-year-old Inez was out on a summer picnic with her parents when she was struck by a bolt of lightning during a summer thunderstorm and killed. Another version of the story is that she was accidentally locked out of the family home -– or was intentionally locked out as punishment -– when she was hit by lightning. The legends also report recent sightings of a young girl wearing clothing from the late 1800s, running and playing in the cemetery. Children who visit the cemetery with their parents report meeting and playing with a young girl, but the parents never see or hear the playmate. There have also been numerous stories about guards and nightwatchmen at the cemetery reporting that the box containing the statue of Inze has been empty whenever there is a a summer thunderstorm. Apparently, little Inez is afraid of being struck by lightning again so, when the storms approach, she runs off and hides. Investigators, however, have poked some holes in the story of Inez Clarke. First of all, there is no "Inez Clarke," not in the cemetery records, and not in the city's census information. 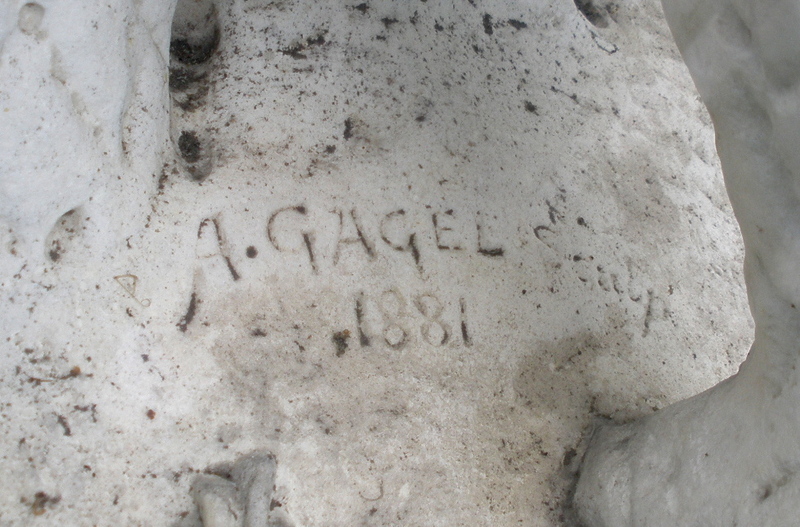 Some of these reports suggest that the statue was simply a sample made by Gagel to demonstrate his artistry, and was placed at the cemetery as an advertisement of his work. That theory, however, doesn’t explain the weathered inscription on the marker beneath the statue. Others have reported that Inez was Mary Clarke’s daughter from her first marriage, her name is actually Inez Briggs, and she died of diphtheria, not a lightning strike. Supporting that theory is the 1880 Chicago census report, which shows a 7-year-old girl named Inez Briggs living with her grandparents, David and Jane Rothrock. And guess who’s buried right next to the Inez statue? David and Jane Rothrock. According to that theory, Inez was sent to live with her grandparents after her parents divorced. After Inez died, her grandparents commissioned the statue. Mary Briggs married John N. Clarke, and somehow all three generations ended up together at Graceland. It appears that the facts don't support the stories and legends of little Inez. But they don't disprove them, either. 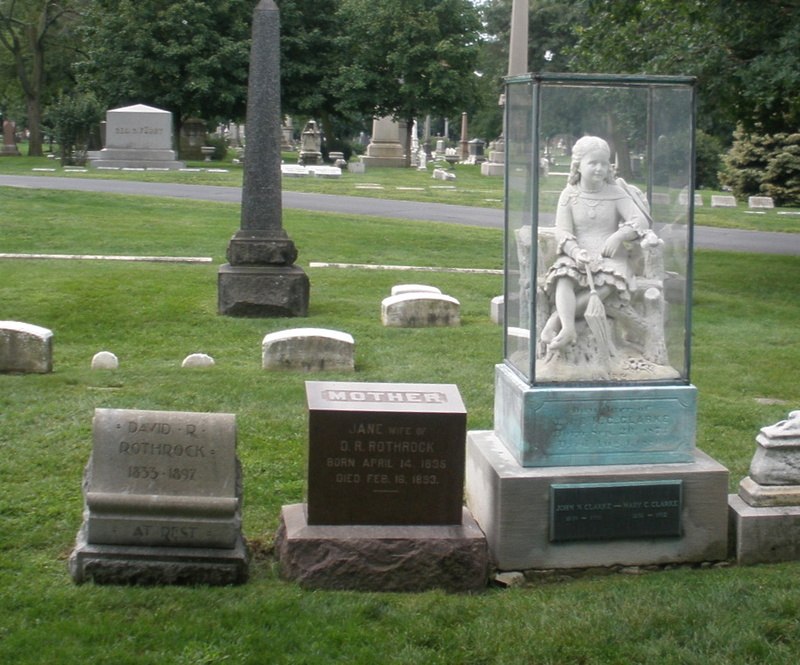 Whether she's Inez Clarke or Inez Briggs, whether she died from diptheria or a lightning strike, on a picnic with her parents or at her grandparents' home, there is no absolute proof that Inez doesn't leave her glass box during thunderstorms, and doesn't play with young cemetery visitors. And whether you believe any of that or not, one thing is certain -– it’s a beautiful statue, and it has inspired some fascinating stories.